The follow-up to last year&apos;s smash hit, ForRealz, #2ForRealz runs on Friday, March 24, and Saturday, March 25, at Pacific Islands Club’s Charley’s Cabaret. Doors open at 6:30 pm nightly. Admission is $10.00. 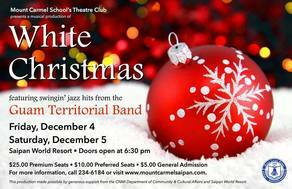 Tickets can be purchased at the Mount Carmel School Business Office. The show is presented with the generous support of Tribe Marianas and Pacific Islands Club. Due to limited seating, advanced purchase of tickets is advised. Due to mature content and graphic language, adult discretion is also advised.